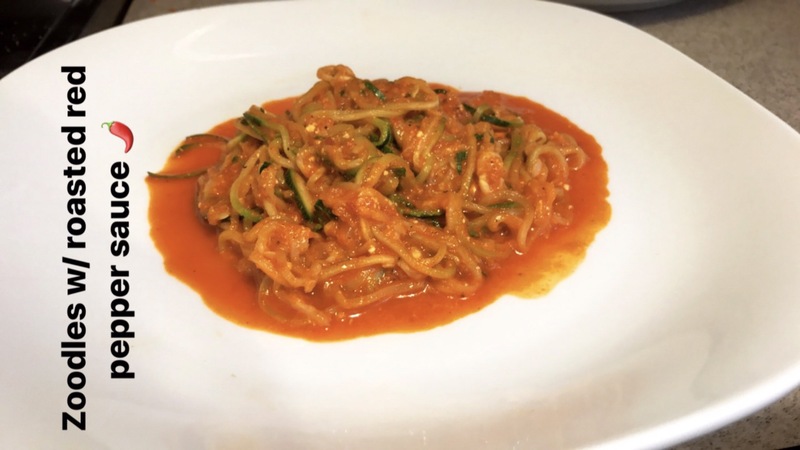 Zoodles w/ roasted red pepper sauce Recipe- Hidden Gem 💎 – The Art Of Realistically Achieving Your Happily Ever After. I wanted to share with you guys one of my favorite new healthy recipes. I’m not sure about you, but I am slightly obsessed with zucchini. You can make it a million different ways and it never gets old (although my husband would disagree). It’s just a universal amazing veggie. It doesn’t get soggy if you meal prep with it, so perfect for on the go! We got a “spiralizer” for Christmas, so we put it to use with this fun colorful recipe. Our 11 monther actually loved it as well, so *BONUS* for you Mommas out there! Tip: You can roast your own red bell peppers by burning the skin off on your stovetop, or you can use roasted red peppers in a jar. 1. Combine 1 tsp. oil, roasted peppers, and cheese; mix well. Set aside. 2. Heat remaining 2 tsp.oil in medium saucepan over medium-high heat. 3. Add onion; cook, stirring frequently, for 3 to 4 minutes, or until onion is translucent. 4. Add garlic; cook, stirring frequently, for 1 minute. Remove from heat. Set aside. 5. Using a vegetable peeler, cut each zucchini into lengthwise strips about ⅛-inch thick. Turn zucchini slightly after cutting each strip to work evenly around the outside, stopping when you hit the seeds at the core. Discard cores. Cut slices lengthwise into ½-inch ribbons. 6. Add zucchini to onion mixture; cook over medium-high heat, stirring frequently, for 2 to 3 minutes, or until zucchini softens, but before it releases liquid. 7. Add salt and roasted pepper mixture; cook, stirring frequently, for 2 to 3 minutes, or until heated through. 8. Divide evenly between two serving plates. Garnish with parsley (if desired); serve immediately.